Depending on his type and his environment, goldfish have the capacity to grow anywhere from around 6 to 15 inches within a very short period of time. If they are kept in tiny aquariums or little bowls, they will still grow, but much more slowly. Those conditions are somewhat cramped for the fish and that will show in how well the fish thrives and grows. Goldfish have no stomachs and digest their food in the intestines, which makes them need to feed much of the time. These fish should have a high alkaline and high protein goldfish food, rather than tropical fish food, which is not designed for consumption by goldfish. Goldfish are omnivorous, so they will eat bugs that land in the tank as well as vegetable matter. Goldfish will also eat smaller fish, like guppies, that share the tank. Being large fish, goldfish need enough water to spread out and have room to swim. 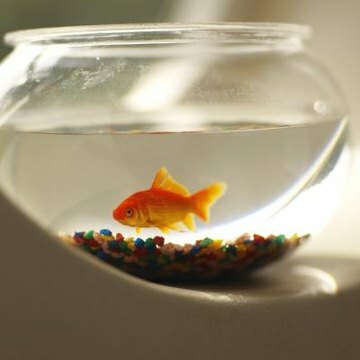 When goldfish are in a tiny bowl, they still grow, but much more slowly. It's best to provide at least one gallon of water per full grown fish. This gives goldfish room to swim and explore their home. Plan the aquarium space according to how big the fish can become, not how big he is at the time of purchase. Believe it or not, goldfish actually thrive in a less-than-perfectly clear water environment. Whether it looks good to the aquarist or not, it's quite healthy for the fish. Goldfish love having some algae in the water to nibble on whenever they feel like it, and since goldfish are always hungry, this 'salad' is a perfect way for them to further their nutrition and thereby grow faster. This is one reason why pond fish grow so fast. Goldfish are cold water fish, meaning they thrive in temperatures ranging from 65 to 80 degrees Fahrenheit. When they have to live in extreme cold water temperatures, such as winter, they partially hibernate and grow more slowly. In a warmer environment, goldfish grow faster, possibly because of the fact that more beneficial bacteria can grow and there are more insects for them to eat. The more and better a goldfish eats, the faster he grows. How Big Can a Goldfish Get?